Set up your brooder wisely to transition your tiny chicks into productive members of your flock. It seems like every brooder setup article starts the same way: You need a brooder container, heat lamp, feeder, drinker and proper bedding. I agree with the concept, but I whole-heartedly disagree with some of the choices used in setting up the common brooder. 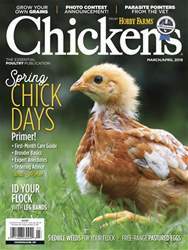 I have raised chicks for years, and like many people, I started by reading articles like the ones mentioned above. I purchased the standard heat lamp, red bulb, waterer, feeder, bedding and thermometer like was stated in each article. While those setups are the typical inexpensive plans, they might not be best for your chicks or your safety. Has the standard brooder setup been revamped in the past decade? It doesn’t appear to have been, otherwise why would anyone still suggest using a device to keep chicks warm that’s also the No. 1 cause of barn fires? (See “Fire Prevention” on page 30.) Beyond heat lamps, the brooder box choices themselves need to be rethought. While drinkers and feeders are important, most any commercially fabricated choice works. Bedding is another extremely important choice, and it has a lot of bearing on the health and safety of the chicks. With so many great alternatives, maybe it’s time to retire the less-than-ideal options.